It makes the reader wonder if he actually read Mr. Klein’s article. The August 6 issue of Time reminds us that oversimplified answers to complicated questions are so attractive, that they survive in the face of overwhelming evidence that they don’t work. You are a far better man than I. I have not been able to read a Time Magazine article since, well…. ever. At least Klein speaks some common sense. Maybe we need a nationwide movement to all wear tee shirts that say “I Might Be Carrying” in order to remind the darker side of humanity (criminals and biased reporters) that plenty of us fully intend to blur the line between victim and fighter. And you just never know who is who. That might send a message that, write what they will, the truth is walking the streets every day. I am not sure I have ever read a book that was better researched and documented (or more dry) than John Lott’s “More Guns, Less Crime”. I am re-reading it now in order to arm myself with the facts pertaining to gun liberties and controls that a few of my liberal acquaintances fail to believe or understand. I dream of a day when our legislators would read and understand this definitive reference. But then, I dream of a day when legislators would actually read their legislation before they try to pass it. I agree that some simple minds need simple solutions. It is a shame they cannot see the simplicity in the phrase “More Guns, Less Crime”. Mas, you are correct. I don’t waste a lot of time reading the Time garbage. Thanks for posting that. I see many shooters quoting some poll showing Americans don’t support more gun control laws. This seems to have put many people at ease so to speak,,,making false assumptions that we are out of the woods when it comes to (more) gun control. I feel quite differently. I closely monitor sites of “anti movements” to see what they are doing, and from what I see the whole “anti movement” has gained real momentum after the two recent tragic shootings. If we don’t continue to fight this fight, we will be stripped of our rights folks. Steps we lose will require much more efforts to get back. Now is not that time for complacency or apathy. Stay in the battle! I will have to read this. I’ve seen several articles of a similar nature (one in Mother Jones that nearly made me throw up) and, to be fair, a good number supporting the trend in concealed carry, etc. I read Time via P/C and agree with you 100%. I saw the Cartoon in Time with the “revolver as a revolving door”, yesterday. I had to comment on the cartoon, that it was the typical left wing liberal media hype that misleads the rest of the American citizens. Sometimes the anti-gun crowd reminds me of a PR person from a losing nation during a war. You know the guy on the loud speaker saying they’re winning despite the other side’s tanks rolling down the street. “…that a majority of Americans would support” is almost as sad as the Brady bunch’s statement that gun sales have been dropping the past few years. As it’s been mentioned, “More guns, less crime” is a great book. I’m still working on my first read through. Free 150+ pg pdf book on gun facts and myths. The author sells a printed version which I’ll be picking up soon. Lots of good information, well organized, and all documented with sources/links. Mas, thanks for taking one for the team. I gave up on reading these weekly rags a while back. Matter of fact I haven’t bought a newspaper either in probably 5 years or so. The various web aggregators and outlets allow me to pick and choose the news articles and authors I want to read. I know the guys on the other side hate us. Let’s keep up the fight, I’ve got to get back into the fight myself. I wonder if I could start an appleseed event? Camp Bullis, used to hold CMP matches. And Mas, please take care of yourself, we need you. We need to get people involved in firearms events, so we can be better prepared, and not just armed. Sorry I missed you in Gold Beach. That little town is our favorite weekend getaway. Did you happen to have dinner at Spinner’s? As for “gun control”, if firearms cause crime, all mine are defective. 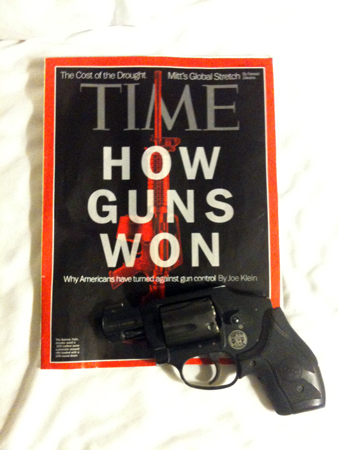 They still publish TIME magazine??? You must be doing recon work. That’s the only excuse I can think of for reading a rag that I don’t even find fit to use in the outhouse. Besides, the ink smears. You will never get rid of crime. It’s part of human nature I think, for some folks. If you restrict guns then all you do is impair the law abiding in their ability to deal with Mongo. Some people look at the world through rose colored glasses and refuse to face reality. They see the world for what it can be and not what it is. Me, I see the world through crimson colored glasses. Sorry to miss you too, Oregon Buzz. Didn’t make Spinner’s, maybe next time. Got to Rogue Outdoors, though: cool place, cool people. I’m in the “I don’t waste my time with Time” camp; thank you for taking one for the team. Opposition research, as it were. I am a hospital-based RN, worked ER for years and have seen the staff culture go from “those terrible guns” to “those terrible a**holes with guns”. Darn glad to see it, too; from doctors to nursed to housekeeping who mop up the mess, the majority face reality. There are still holdouts, but they are the type who would vote for someone if he was urinating on their showd if he was of the right party…. come to think of it, ain’t that what we have? Eric Holder, anyone? Mick makes a good point. On the West Wing TV show, there was one particular “conservative” moment I simply loved. Feisty conservative Ainsley Hayes was responding to an anti-gun rant from arch-liberal Sam Seaborn: “Your problem, Sam, is that you don’t so much hate guns as that you hate the people who like guns.” Sam was flabbergasted. We cheered. One bright moment in an otherwise totally-liberal show . . . which we liked because it was so well-acted. On the other hand on CBS Sunday Morning, Ben Stein was making a case for logic and reason. He pointed out that many of the places with heavy gun control also have have lots of gun violace and that it is a complex problem.